This cranberry sauce with orange juice is really easy to make and is absolutely delicious for the holiday table. 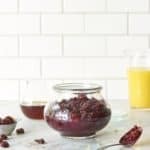 This cinnamon ginger cranberry sauce with orange juice is my favorite homemade cranberry sauce recipe. and it goes on the table at every Thanksgiving and Christmas. This cranberry sauce goes on our holiday table every year, and has for many years. It is ridiculously easy, and absolutely scrumptious. 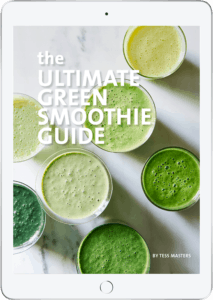 This is one of those quick easy hand blender recipes that is a winner! Once you make this cranberry sauce with orange juice you will never be caught dead buying a jar of pre-made cranberry sauce again. 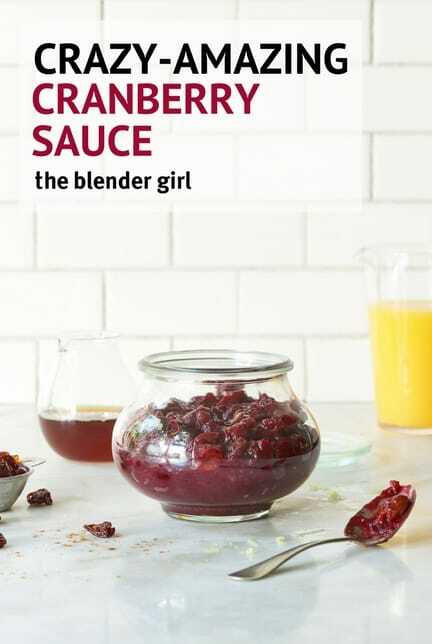 I have always loved homemade cranberry sauce, and this blend is a winner. I have deliberately kept this cranberry sauce very basic. I love the simplicity of the flavors — the hint of spice that is lifted with the zest of the oranges. But add the quantities of cinnamon, ginger and sweetener that work for you. This was my perfect blend, but you might want more spice. I liked just a hint, in order to let the cranberries have their moment. 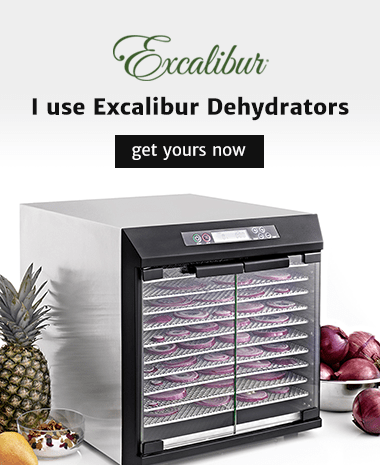 The flavors will infuse in the fridge. Like a good sangria, this cranberry sauce gets better with time. If you can wait that long! This cranberry sauce is fantastic for the holiday table. But it’s also an amazing fruit compote that can be enjoyed all-year-round, and is fantastic with ice cream. I’ve even been sprung spooning it into my gob directly out of the jar! Either way – this cranberry sauce is fantastic. Enjoy all of those holiday parties. I am going home to Australia this year. My mum and aunties cook for months leading up to the event. They all bring their signature “yummies”; and a different family hosts the event in their home state each year. My mum makes her apricot rolls, brandy sauce, and summer berries; my Auntie Colleen makes her cornflake cookies and mini pudding chocolates; my sister Kara, and her husband Leigh make their famous Christmas pudding; my cousin Kim makes her incredible rum-balls; and my Auntie Lynne always makes her famous “super-moist” fruit cake, which I still maintain, is the most incredible fruit cake I have ever tasted in my life. I would have shared it with you this year, but sadly, the fruit needs to marinate for a month, and I wasn’t organized enough to post the recipe a month ago! In a medium saucepan, combine all of the ingredients, and on a high heat, bring the mixture to a boil. Reduce the heat to medium-high, and simmer, uncovered for 10 to 15 minutes until some of the cranberries have burst open, and the mixture reduces and thickens. 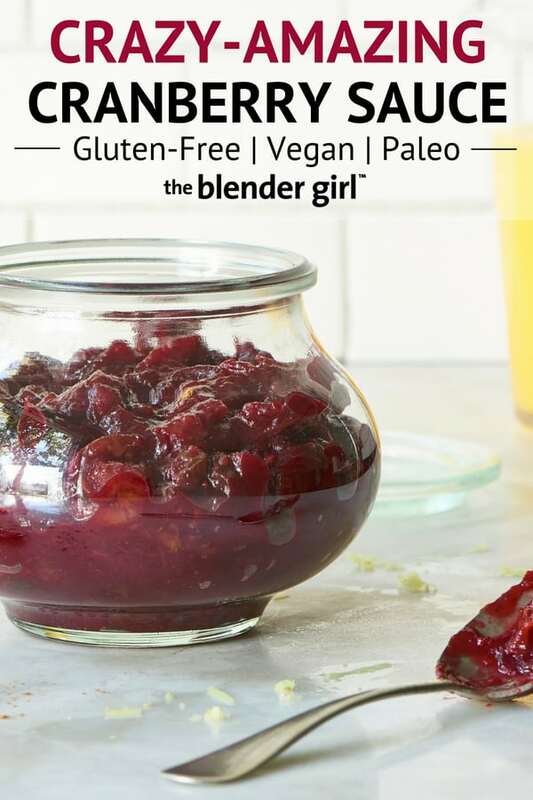 Smash the remaining cranberries with a wooden spoon or use a stick blender to reach your desired consistency. Chill in the fridge for a few hours or overnight to allow the sauce to thicken and the flavors to infuse. This tastes even better the next day.